Upload more screenshots for things missing them. 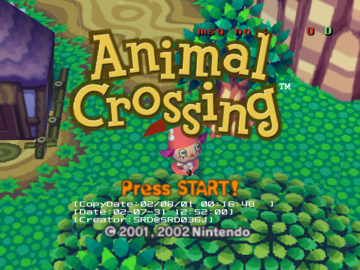 While this game was the west's introduction to Nintendo's quirky, then-budding life simulator franchise, Animal Crossing is actually a GameCube port of Doubutsu no Mori for the Nintendo 64, heavily modified in localization to give westerners an experience analogous to what Japanese players got. The localization was apparently so impressive that it got re-localized for Japan with added features, effectively making it a localization of a localization of a port. 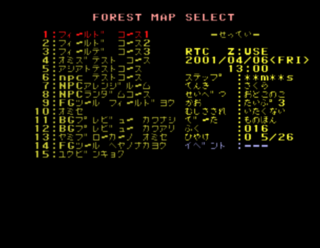 The game has a debug mode, called "zuru mode" in the code, with two different levels. 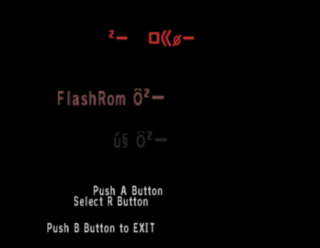 Mode 1 can be activated on a regular retail game by entering a special button combo on a controller in the second port. 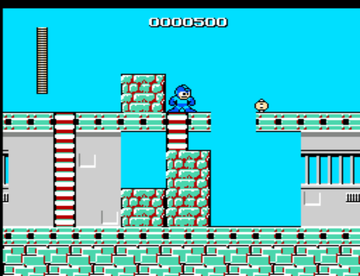 The full debug mode, mode 2, is activated based on the game's disc ID. If the ID is 0x99, zuru mode 2 will be activated immediately and remain on at all times. If the ID is between 0x90 and 0x98, mode 2 only becomes active when a controller is plugged in to the second port. When debug mode is activated, the letter "D" will appear in the top right corner of the screen. In mode 1 the letter is yellow, and in mode 2 the letter is green. Mode 1 has fewer capabilities than mode 2. Entering the code while already in mode 2 will display a debug output for the button combination, tracking the status of the user's progression through the button code. To activate the full debug mode, set the disc ID version field to 0x99. Use a hex editor to change byte #7 (0x00000007) of the ISO/GCM file. It works on all versions – the North American, European, Japanese (both versions), and Australian games can all be modified in this way. This is only available when the disk version is set to 0x90 or greater (mode 2). Pressing Start toggles the debug item spawner on and off. When enabled, the text ナシ (nothing) appears on screen. Holding B while changing the number will increase/decrease the number by 10. Holding A while changing the number will increase/decrease the number by 100. Pressing X will fill in your entire catalogue. In Dōbutsu no Mori e+, pressing Y will cycle your Kanji proficiency level between the different modes. L+R - Freezes the emulation when held. 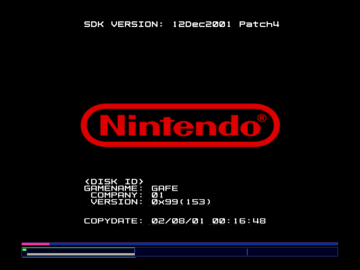 If a certain debug flag is set, this will display the NES game file menu. 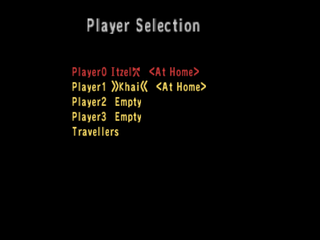 The player select debug menu allows the selection of any of the four players, or any players visiting from another town. If the player selected doesn't exist, it will start the new player creation sequence with Rover. 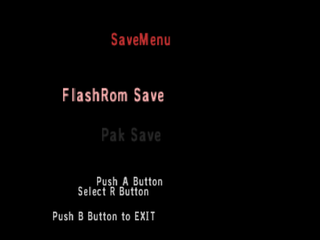 The save type selection menu allowed the developers to test both saving to a Flash ROM and N64 Controller Pak. The NES emulator has a "filer mode" that can be used to cycle through the in-game ROMs. When debug mode is enabled, there's also a text display showing the ROM filenames and a demo mode toggle. Each of the playable NES games that can be obtained in-game come as an individual furniture item featuring an NES Console with a game box on top of it. 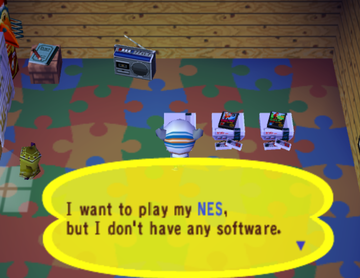 There is also a generic NES Console item that can be purchased from Redd that was originally thought to be unplayable, because it would only display the message "I want to play my NES, but I don't have any software." This item actually scans memory cards for special files that contain NES ROMs. ROMs loaded from the memory card are loaded into the same NES emulator used for the built-in NES games. The code for loading these ROMs is fully working and features an entire system for loading ROMs and ROM metadata, as well as creating save files for each external ROM. 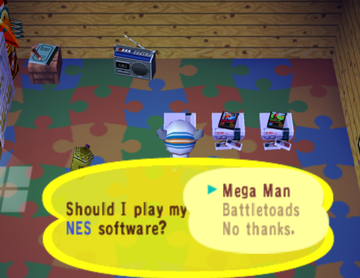 It seems that Nintendo originally intended to be able to release more NES games for Animal Crossing on memory cards, but never followed through with it. One of the metadata tags in the ROM loader supports patching ROMs after they are loaded. 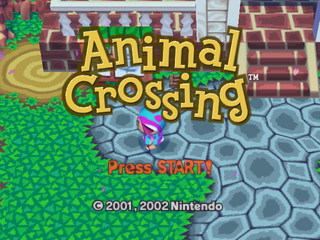 This tag can also be used to patch Animal Crossing itself, allowing mods to be loaded via memory card. An odd unused NPC, formerly fandubbed "Blazel" can be found within the game's code; her earlier nickname comes from the fact that her design incorporates several elements of that of both Bliss/Caroline and Hazel. However, recent digging within the files of Doubutsu no Mori + has revealed her Japanese name to be Shaki~tsu (シャキッ), meaning "Chestnut"; immediately following this name is the text "とりゃ〜" (Torya〜), which may have been a catch phrase. These two text files are the last ones in the game's code associated with Chestnut, indicating that she may have been removed late into development. Internally, her texture and model files refer to her as "xsq", which likely means extra squirrel. 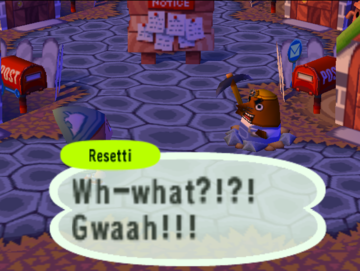 However, despite initial speculation that Chestnut may have been a cut villager, there is prominent evidence suggesting that she was actually meant to be a special character. In the game's code, Chestnut is referred to under the filename "ac_ev_dokutu", which can be broken down into "Actor Event Dokutu". Characters with "ev" in their filename are travelling characters like Crazy Redd or Saharah, while "dokutu" most likely is shorthand for "dokutoru" (ドクトル), a katakana rendition of the English word "doctor"; most other actor characters also had their names shortened in code. This combination of traits points to her having been been a travelling doctor of sorts, likely being cut due to either time constraints or an inability to find a useful or interesting function for her. 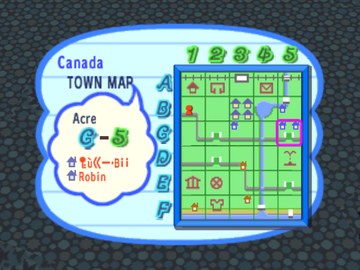 Chestnut can be spawned into a player's town using the below Action Replay code, using xxxx as a regular villager, with yyyy being set to either D06C or E15A. Because her text data was overwritten, Chestnut will use one of Kapp'n's dialogues when D06C is used. 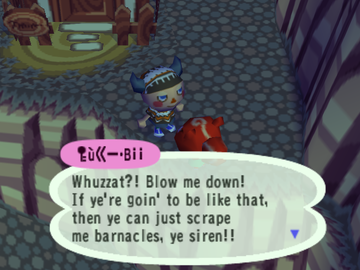 When E15A is used, she'll use whatever text corresponds to the villager she overwrote's gender. If she is spawned into a player's town with the above code and yyyy set to D06C, her name will be displayed as "[key symbol] ù«–•B¡¡". 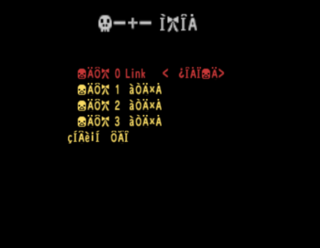 This is the default name for special NPCs, which was untranslated from Doubutsu no Mori+ (ジョニー・B) and translates to Johnny B; the garbled appearance of the name is the end result of the game attempting to display text characters that no longer exist in its code, instead displaying characters that occupy the same hexidecimal positions as their kana counterparts. 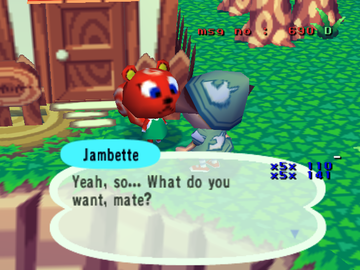 When using E15A, she will take Jambette's name; this is because Jambette's villager index is cataloged first at E05A. 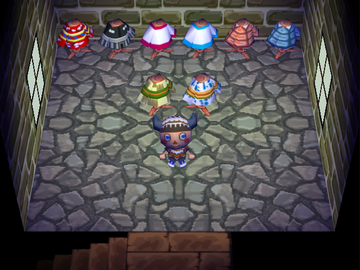 Because villager text data data wraps around after E0FF, long before E15A, Chestnut will use Jambette's data by default. A tool labeled "Sickle", which makes the player function as if they had nothing in their hands. Strangely, it appears as a toolbox when dropped, a feature that only appeared in Doubutsu no Mori (evidencing that the icon is still in Animal Crossing's code), Wild World and New Leaf. 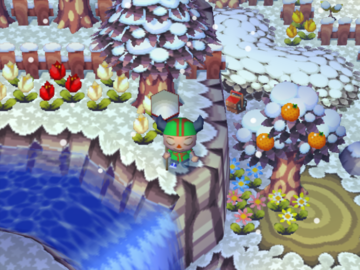 Toolboxes can also be seen in Animal Island, but do not typically appear in the base GameCube game during normal course of play. Paper Airplanes which, if you place on the ground, walk offscreen, and come back, will duplicate itself. Pressing A while on top of the paper airplane will make it disappear visibly, but will still exist in the system's memory. When the airplanes fill up an acre, that acre shuts down and is rendered inaccessible. Letting the airplane multiply too much can shut down the player's entire town and crash the game. 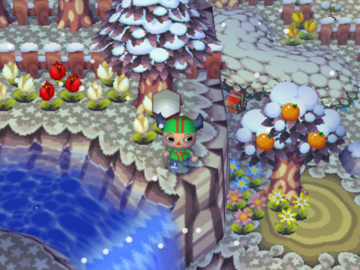 In Dōbutsu no Mori e+, two unused seasonal environment palettes were added for grass. These palettes go unused in the final game. The first palette appears to be for a transition between fall and winter, as the grass underneath the bush is green. The second palette is likely for mid or late winter. message_data.bin contains two messages that mention E3. It appears they would be used if the player tried to send mail at the post office, possibly while playing an E3 demo. This page was last modified on 5 November 2018, at 02:35.